Aiseesoft iPad Converter Suite Platinum consists of three wonderful iPad softwares: Aiseesoft DVD to iPad Converter, Aiseesoft iPad Video Converter and Aiseesoft iPad Transfer Platinum. Aiseesoft iPad Converter Suite Platinum is packed with DVD to iPad Converter, iPad Video Converter and iPad Transfer Platinum. With it, you can rip any DVD disc and convert popular video/audio files to iPad, export music, movies, pictures, eBooks, iTunes U, TV shows, podcast, camera roll, voice memos and camera shot from iPad to computer, and import local video, audio, ePub, PDF, and image files to iPad with zero loss. Now it supports iPod Touch 5 and iPod Nano 7, and adds iPad mini, iPad 4, Microsoft Surface and Samsung Galaxy Note. This transferring software works well with nearly all Apple devices, including iPad, iPhone and iPod. 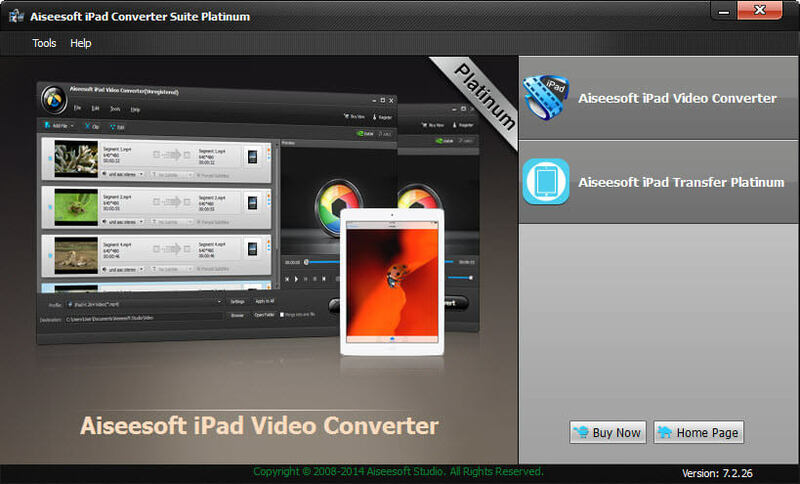 Aiseesoft iPad Converter Suite Platinum can rip and convert any DVD to iPad video/audio formats. This iPad Converter could convert all popular video formats, such as MPG, MPEG, MPEG 2, VOB, HD TS, HD MTS, HD M2TS, HD MPG, etc., to the formats supported by iPad. It allows to transfer music, movie, pictures, TV shows, podcast, iTunes U, eBooks, camera roll, voice memos, camera shot, etc. from iPad to computer at remarkable speed. Aiseesoft iPad Converter Suite makes it easy for you to adjust video brightness, contrast and saturation for the customized playing effect. What is more, the function of Deinterlacing allows you to convert the interlaced video to a progressive one. For great work efficiency, it is possible for you to set Video Encoder, Resolution, Frame Rate, Video Bitrate, Audio Encoder, Sample Rate, Channels and Audio Bitrate. The built-in player of this iPad Converter Suite provides you an access to preview the original video and the output video effect. 123 DVD Converter provides a fast, easy way to copy your favorite DVD movies onto hard drive in high quality VCD, SVCD, AVI, DivX, WAV formats.